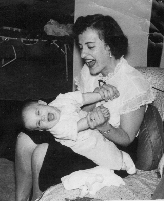 Today would have been my mom’s 92nd birthday. This is a repost of a blog I wrote 2 years ago. I hope you enjoy it. Today, Mom would have turned 90 years old. We lost her on July 18, 2005, after a brutal and harrowing couple of months that I covered here, here, here, and here. I am very fortunate that in her final years on this earth, I made my peace with her and she with me; her last words to me were “I love you, you’re my prize.” A person can live happily for a long time on a memory like that. For me, winter and early summer are about my dad; he was a January baby, and we lost him (literally) in June of 2010. Spring is always about my mother; when the snowdrops start to peek out of the cold ground, and crocuses begin to unfold, the forsythia blossoms bright yellow and the Bradford pears start their bridal march up Northern Boulevard, their white blooms wafting on the warming breezes, my mother is close by. She’s never too far– there are times when I imagine I see her face in the mirror overlaying my own– but she breaks out in the spring. 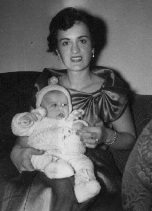 It’s her birthday, Greek Easter, Mother’s Day, our first communions…spring is and always has been her season. When I was a teenager and then a young adult, and thought I knew everything about everything, we rubbed each other the wrong way, often. As stubborn as my mother was (she was, after all, born on the cusp of Aries and Taurus), I could match her. We would yell and carry on; she’d forbid me to do one thing or another, and I would do it any way. I honed my passive-aggressive skills at her knee. If she knew she was right, she would not cave; neither would I. Those battles were great training for life. It wasn’t until I was older, and we made our peace with each other, that I recognized what a boon her fighting spirit was to me. When I was young, I felt thwarted by her restrictions and demands and opinions; in retrospect, I see that her fighting spirit was what made my life possible. I decided sometime around the fifth or sixth grade that I wanted to go to the High School of Art and Design. The twin sisters of a grade school classmate had been accepted to A&D, and when I heard about it, I wanted nothing more than to go to a school where I could draw all the time. I told my folks, and I think they were hoping I would get over it, the way I got over wanting to be a nurse (when I was six) or a Maryknoll Missionary nun (when I was eight). I didn’t get over it. Fast forward to eighth grade, and taking the diocesan placement tests in mid-autumn (for the Catholic high schools); my choices were Mater Christi (where almost all my friends would go), The Mary Louis Academy (where my close friend Carol was trying to persuade me to go), and St. Agnes (where I REALLY did not want to go, but I needed to list three schools). I did very well on the test, and would have no problem going to the school of my choice. In January, I had the placement test and portfolio submission for the High School of Art & Design. I’d worked on my portfolio all during my Christmas vacation with Our Lady of Sorrows’ third grade-and-art teacher, Miss Mary Biedermann. She helped me matte all my artwork while listening to Leonard Cohen songs (a revelation!) and eating brie (ditto!!). It was a glimpse of what a student artist’s life might be like and I was hungry for it. I wondered in later years if the nuns knew that Miss Biedermann had helped me; she did so outside of class and on her own time, in her own home. I travelled by myself on the subway with my art and supplies in hand; she picked me up in her car near Borough Hall on Queens Boulevard to take me to her place in Richmond Hill. I do not remember how or by whom the arrangements for all of this extracurricular activity were made. Miss Biedermann wasn’t even my teacher– my middle sister Nancy was in her third grade class– but, at some point, my parents had to be involved with the planning. I remember bringing home the day’s matted work and showing what I’d done to my mom and dad; I remember thinking they did not really understand what I was doing, but at least they were not fighting me. 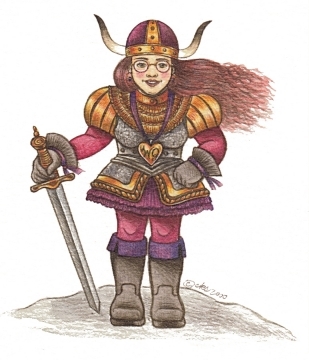 At that point, I don’t they thought I would get into A&D; they knew I loved to draw, but I don’t know how talented they thought I was, or –even if I was talented enough– whether this was a path from which I could be diverted. There were no artists in my family; there was no road map for them, or me, to follow. They were not sold on the idea of me being an artist…but time could change things, and anyway, maybe I wouldn’t get into A&D. I got into Art and Design; my real life would begin that fall. All I had to do was tell Sister Mary Dorothy, the principal of Our Lady of Sorrows. I told my teacher, Sister Regina de Lourdes, that I’d been accepted to A&D. She, or someone, told me and told my parents that there would be a full scholarship for me to go to The Mary Louis Academy, an offer which was rarely made to anyone. I told my parents about the scholarship, and that I didn’t want to go “Snob Hill” (what everyone called The Mary Louis Academy in those days).My mom asked me where I did want to go, and I said Art & Design. They asked me if I was sure, and I was, so that was that; there was no fighting. I recognize now, as an adult, what an extraordinary leap of faith that was for my parents to make. Their firstborn thirteen-year-old daughter would be going to a high school that none of her classmates were attending, taking a subway into midtown every day, learning to be a professional artist. She/I would be doing this instead of going to a Catholic high school that wanted me enough to pay the full freight, a high school that would put me on track to St. John’s, Fordham, or even an Ivy League school.Inexplicably, they let me do what I wanted to do. It wasn’t over at OLS, though; Sister Mary Dorothy was incensed by my choice. She called my home while I was in school to speak to my mother. She yelled at my mother, carried on about how my mother was letting me ruin my life, that I wasn’t old enough to make such a choice, and on and on; she pulled every manipulative trick in the book to try to get my mother to change her mind, or better yet, change my mind for me. My mother refused, and told Sister that it was my choice, and it was done. Sister persisted, and yelled some more. My mother hung up on her. She fought for me, against every grain of her own doubt and fear about my choice, and she hung up the phone on the principal of my school. I don’t know that I would have been so brave had I been in my mother’s place. That is love, and courage, and faith, and hope, wrapped in the fighting spirit that my mom held on to until her last breath. She not only gave me life, but she gave me MY life, the life I was truly meant to have. 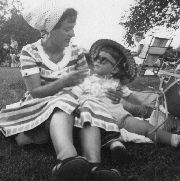 On this ninetieth anniversary of her birth, I say THANK YOU, Mom, for all your many gifts, but especially for that one. It was the fork in the road that made all the difference. Do you like what you’re reading here at my blog? Do you want to follow me? 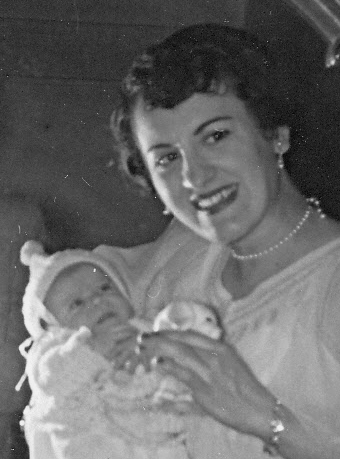 My Mom would be 89 years old today. We lost her in 2005, after a harrowing month-long stay in the hospital precipitated by spinal surgery. It was only at the very end of her life that my mother’s indomitable strength and will began to fail her. She was born stubborn. She was named for St. George (slayer of dragons), whose feast day is the day after her birthday. She resented her name, Georgia; her parents wanted to name her Hariklia (Harriet), I believe to honor her father, whose name was Hercules. Her godfather overruled her parents (my mom never explained how that happened), and she was christened Georgia instead. I love the name; I think it suited her well, with its evocation of strength and a willingness to fight to protect the weak and fearful. Her parents had come to America from Larissa, Greece when they were in their early twenties. We have a photograph of our maternal grandparents that was taken just before they left their home country; they are beautifully dressed (it may have been their wedding picture) and they look so young, and so full of promise and hope. They settled in Hell’s Kitchen, around the corner from Holy Cross Roman Catholic Church in Manhattan. The Depression came. Promise turned to disappointment; my mother’s father abandoned his wife and daughters, leaving my grandmother to support my mother and aunt all on her own. My grandmother had only a fifth grade education and spoke very little English, and there was little work to be had. At one point, my grandmother was so desperate for food for her girls, she went to Holy Cross to ask the pastor, Father McCaffrey, for help. Even though they were Greek Orthodox and not parishioners of the church, Father McCaffrey saw to it that they never went hungry, and my mother and aunt attended Holy Cross school until they moved out of the neighborhood. My mother always said that if it hadn’t been for Father McCaffrey’s kindness, they would have died of starvation in the streets. She thought that Father McCaffrey was a living saint. When he passed away in 1970, more than 20,000 people attended his funeral; my parents were two of those people. After Mom, and then Dad, passed away, our family requested donations to the Holy Cross Food Pantry instead of flowers, to honor our parents’ memories. What my mother wanted more than anything while she was growing up was to be married and raise a family. She wanted four boys; she and Dad got four girls, and then our brother, all in nine years. I don’t know how she did it; our house was always clean, the wash was always done, and every night, there was a hot, home-cooked meal that we all shared–along with our stories of our day–around the kitchen table. When I look at the pictures of all of us from my childhood, I am struck by how truly lovely she was. She kept herself, and all of us, beautifully. She went to work part-time at Gertz Department Store in Flushing when I was in sixth grade; it was good for her to be out in the world, and there were huge benefits to us in the form of really nice clothes at a discount, and lessons in how to shop wisely. She kept working in retail–at Gertz, then Stern’s, then Bloomingdale’s–until she injured her back on the job. That injury was what eventually led to the last surgery that resulted in her dying of sepsis from an infected surgical wound. Her last month was heartbreaking for all of us, for my father most of all. After she passed away, my father visited her grave every day, in every kind of weather. He told me not too long after she died that the very best thing he ever did was ask her to marry him. In the years after she died, he would often say that he just didn’t know how she was able to do everything she did for all of us. My thought about my dad’s last walk, the day he disappeared into the woods of Union, is that he went off the path because he thought he heard her calling him. I hope he found her, and that they are together now, smiling on the family they created. to honor my mother on her birthday. Mom, this one is for you. I love you and miss you every day.